Cheri Hudson Passey has been researching her family for over 30 years, and her 1-on-1 classes provide help for genealogists of all levels. Her blog, Carolina Girl Genealogy has helped her connect with family and share valuable information with the genealogy community. She is a member of numerous professional genealogy societies and associations, as well as a member of many South Carolina societies. 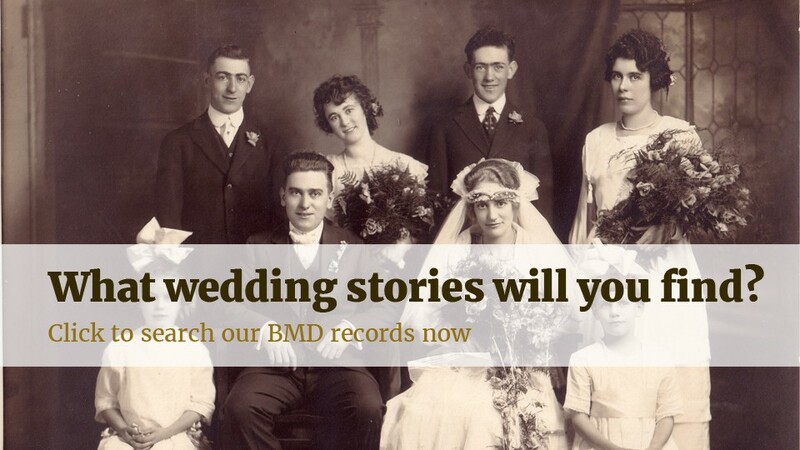 The release of US marriage records on Findmypast inspired me to search for the marriage record of my paternal great-grandparents, Jubal Ransom Early (1888-1964) and Emma Ruth (Baker) Early (1900-1993). A genealogy record prepared by a great aunt listed the marriage date as 22 June 1922, but searching South Carolina records where they met and lived has not proved successful. 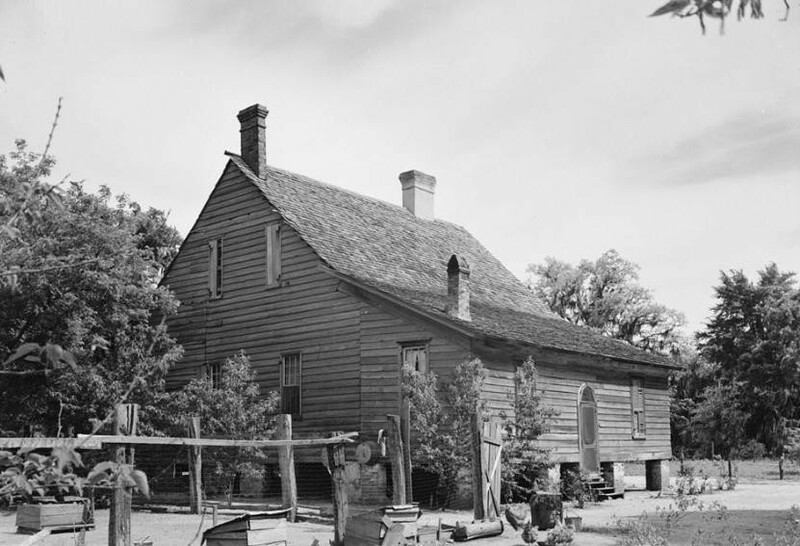 Jubal was born in Statesville, Iredell, North Carolina and was said to have married my great-grandmother after meeting her while travelling to the Sumter County, South Carolina area for work. The marriage record of Jubal Ransom Early revealed a puzzling twist - not only was the date far earlier than I thought, the woman he was marrying was not my great-grandmother! I was pleasantly surprised to find a record match but very confused at the date and the name of his spouse. 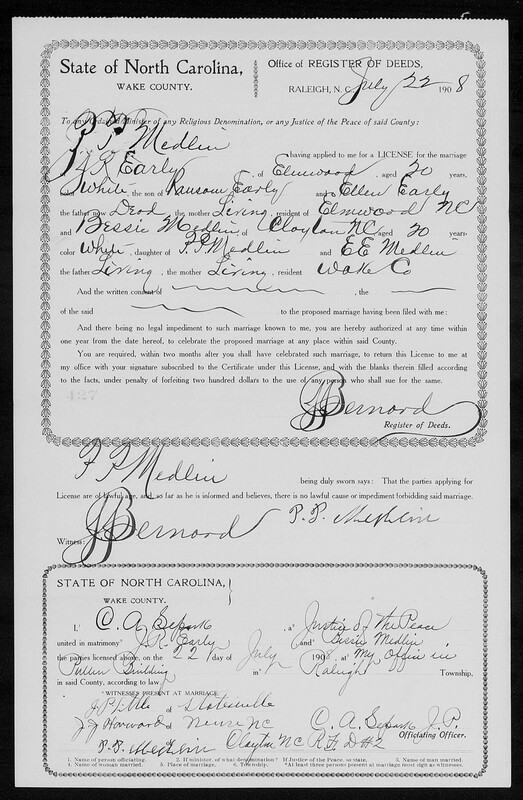 This record was of a 1908 marriage in Raleigh, Wake, North Carolina to a woman named Bessie Mae Medlin. This was clearly my Jubal as his parents, Ransom and Ellen Early are on the certificate. What started out as a search for my great-grandparents' marriage record turned into a stunning revelation: Jubal Ransom Early had married before he married my great-grandmother. Although this was the first evidence I encountered, family rumors have spread the tale of other women in Jubal's past. A headstone discovered a couple of years ago in a cemetery in Statesville, North Carolina gave some credence to the gossip. James Ransom Early (1915-1916), son of J.R. and Nancy Early, was buried in Bethesda Presbyterian Church Cemetery in Statesville, North Carolina. His death certificate lists his parents as Jubal R. Early and Nancy (Horton) Early. Both James and mother Nancy were born in South Carolina. Research into Jubal and Nancy's relationship is ongoing. Now, there was Bessie - a third woman. Who was she? Could I find any more about her? More research led to Bessie's death certificate and subsequent marriage to a man named Herbert A. Craft in 1914. Were Jubal and Bessie divorced? He was the father of a son with Nancy in 1915. Were they married? Jubal filled out his WWII draft papers in 1917 and wrote that he had a wife and child. A newspaper report in that same year had him in the list of those who were exempt from serving. The reason? He had a wife and child. His son James had died, so was there another child with Nancy? Historic plantation house in Sumter County, South Carolina (1933)Library of Congress Prints and Photographs Division Washington, D.C.
Jubal Ransom Early married my great-grandmother Emma Ruth (Baker) Early, according to family, on 22 June 1922. They were the parents of three daughters, one born in 1920 before the marriage. All of these children were born in Sumter County, South Carolina. Jubal and Ruth lived in Columbia, Richland, South Carolina for many years. They are said to have eventually divorced. Was Jubal still married to Nancy at the time of the 1920 birth of his daughter with Emma Ruth Baker? Did a divorce or her death free him up to marry again by 1922? Was he ever legally married to anyone other than Bessie? While trying to answer these questions, another shocking revelation was discovered. Just two years after her marriage to Jubal, Bessie Mae (Medlin) Early was living in the 1910 Census with her parents and son, Odell. According to other records, Jubal Odell Early (1908-1998) was born in 1908, just months after his parents were married. So, my great-grandfather Jubal had another son, one that lived until 1998. My grandmother had a half brother that she never knew! What did Jubal Odell Early know about his father? On his 1939 marriage license, he filled out that his father was Jubal Early, deceased. Was he told that his father was dead when in fact he didn't die until 1964? Did he ever know that he had a half-brother who died as a baby and three half sisters just a state away? Did any of the families know about the existence of the other? There are many more threads to unravel in the tale of Jubal Ransom Early. I hope to have more updates soon!